In 2010, 10,208,400 children and youth called Canada home. Of these, approximately 5.6 million were infants, toddlers and young children between the ages of birth and 14 years; and 4.6 million were youth and young adults aged 15 to 24 years. There was an overall increase of approximately 160,000 in the total number of children and youth from birth to 24 years compared to the population in 2000. The number of younger children age 0 to 14 years was slightly less in 2010 compared to 2000 while the number aged 15 to 24 years increased from 4.2 to 4.6 million in 2010 compared to 2000. 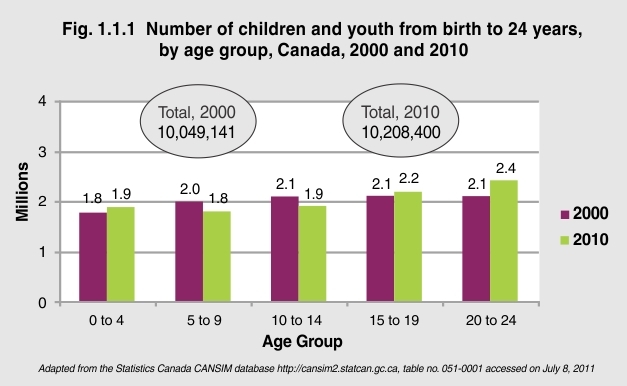 The number of children and youth living in Canada continues to increase. All of these children require caring and nurturing families and communities, as well as resources and services, so that they can reach their full potential. The relative increase in youth and young adults aged 15 to 24 years highlights the need for ensuring continuity of care when youth move from child to adult social and health services.